- A feature article on "926 Save Chinese Education Campaign"
The rejection and suppression of the banners against Wee Ka Siong and MCA by the organiser of "926 Save Chinese Education Campaign" (especially the two banners on the right) – Was it a hidden agenda of the leaderships of Dong Zong and MCA? At about 5 a.m. early in the morning of 26 September 2012, 3 FOS Johor committee members (Chen Xin, Goh Chee Horng, and Liang Peck Kuan), together with Mohd Nasir (PAS Chinese Community Liaison Officer), drove to Simpang Renggam to meet up with some local Chinese educationists. All of us then travelled by bus hired by the Chinese School Committees and Teachers' Association Johore, to the venue of 926 rally. We distributed leaflets on FOS statement entitled "926 Demand for resignation of Wee Ka Siong - a symbolic demand expressing the resentment of the Chinese community" to the passengers on the bus. They were quite engrossed in reading the statement. Some of them even struck up conversation with us, and expressed their agreement with and appreciation towards our views on this issue. We reached Padang Merbok, the venue of the rally at about 10.45 a.m. There was a drizzle, but that could not dampen the spirit of the masses. Everyone came either carrying an umbrella or in raincoat, bringing along with them banners or placards to be displayed. We were particularly excited when we found that many slogans shown on the banners and placards were expressing the common aspirations of the masses demanding for Wee Ka Siong's resignation as well as spurning and rejecting MCA. This is undoubtedly the most significant concrete action on the part of the masses in support of Dong Zong's "926 Save Chinese Education and Protest Movement". We were one with the masses demanding resignation of Wee Ka Siong before the official opening of the assembly in response to Dong Zong's call to fight for the interests of Chinese education. We split into two teams: one team distributed leaflets to the crowd, while the other team held up our banners. When the organiser using microphone invited the crowd to "gather on the platform", Chen Xin, Nasir together with a few others (who came in the same bus) immediately responded to the call. They carried two bilingual banners and slowly moved towards the steps leading up the platform. 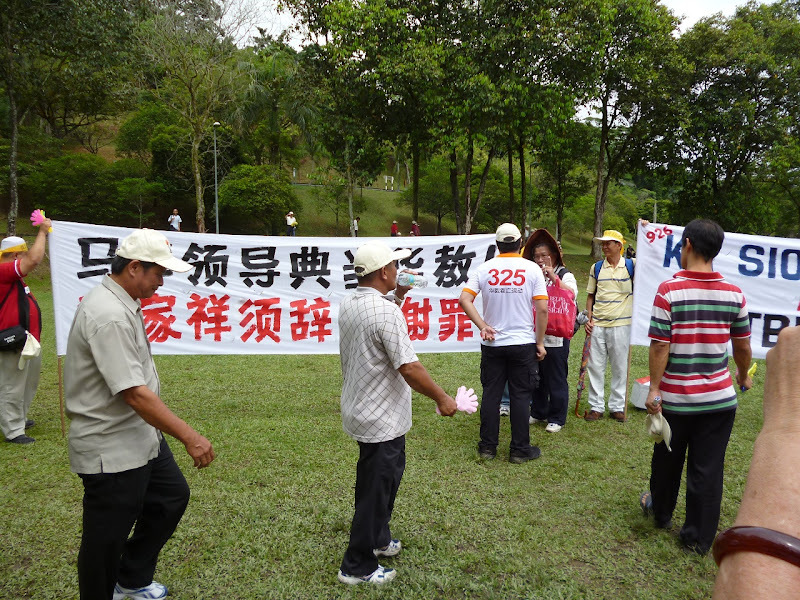 The banner in Chinese read: “马华领导典当华教！魏家祥须辞职谢罪！” ("MCA leadership sells out Chinese education! Wee Ka Siong should resign to make an apology!"). 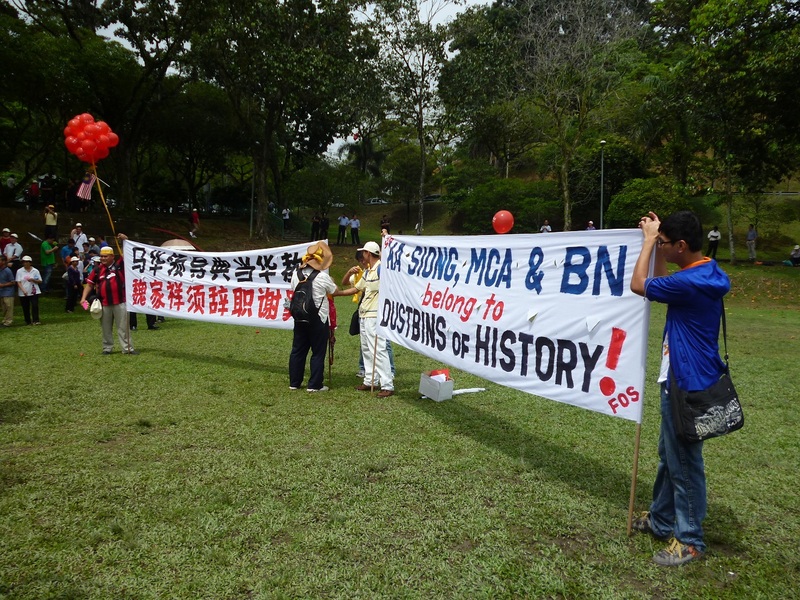 The banner in English read: "KA SIONG, MCA & BN BELONG TO DUSTBINS OF HISTORY!" Some of the masses could not refrain from repeatedly clamouring for Wee Ka Siong's resignation at the sight of our bilingual banners. When we tried to move our banners higher up the platform, the organiser immediately made an announcement: "Please remove any banners with political overtones. Your views and feelings are noted. We appreciate your cooperation." Standing on the stairs leading up the platform, we insisted on displaying our banners. An elderly person (in white shirt facing the camera) approached us (without telling us who he was), demanded the removal of our banners. Chen Xin then asked him, "Isn't it true that Dong Zong issued a statement listing 5 indictments against Wee Ka Siong and demanded for his resignation? ", "Please tell me: What's wrong with the contents of our slogan?" He did not answer these questions, but left mumbling in a fit of anger. While standing on the stairs on a higher level leading up the platform, we managed to display our two bilingual banners, expressing the aspirations of the Chinese community. Meanwhile, some among the crowd shouted for Wee's resignation, expressing their resentment against MCA and BN. This undoubtedly showed that the masses were extremely irritated by the constant move on the part of MCA leadership to sell out Chinese education. They realized that only by disdaining and rejecting MCA leadership and BN's hegemonistic rule, will there be any hope of ending the plight of the masses. The organiser repeatedly urged the masses, through microphone, not to display any banners or placards with political overtones. Now and then, they appointed personnel to harass those who did not comply with the request. Pictures above: Some of the crowd expressing their indignation against Wee Ka Siong and MCA leadership were forced to put aside their banners or cover up the portion of the banners that contained sensitive words like "Wee Ka Siong". In the end, they could only show the remaining portion of the banners with incomplete slogans. Top left: the banner brought by Kampung Batu 9 Cheras Committee. The complete original slogan was: "Wee Ka Siong, Deputy Education Minister practised sophistry! Lots of education problems remain unresolved." Top right: Another original slogan read: "Saying one thing but doing another. Wee Ka Siong, please explain!" Bottom left: The banner from Kampung Baru Semenyih Committee. The original slogan is: "Wee Ka Siong, Deputy Education Minister is incompetent. The issue of shortage of Chinese school teachers has been dragging on year after year." Bottom right: The original slogan: "Wee Ka Siong sells out the interests of Chinese education"
(Phrases highlighted in grey were hidden after complying with the organiser's request). How would you feel after seeing such slogans, which are neither fish, flesh nor fowl? How would you feel after seeing the top leaders in the highest governing body of the Chinese education making such preposterous request? At about 11.30 a.m., with a view to avoiding unnecessary conflicts, and to avoid being accused of disrupting the rally, we decided to leave the platform. We continued to display our two banners in the field. 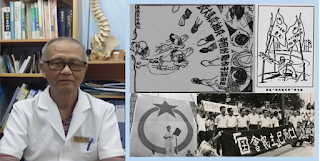 Picture above (from left): Nasir (wearing Kopiah), Chen Xin (wearing leather hat), Nyam Kee Han (behind the banner), the supporter (in yellow T-shirt and white trousers), Lee Chen Feng (in blue jacket). Our banners in the field immediately attracted some participants. They put up their banners and placards with similar contents side by side with ours. A man in black shirt, holding a video camera, approached us with a scowl and said "Didn't the organiser say that the assembly should not be involved in politics? ", "Why are you still displaying the banners/placards here? ", "You are out to destroy Chinese education!" Chen Xin retorted, "We have the right to be here to express our views on the Chinese education issues. What right have you got to prevent us from doing so?" When Chen Xin questioned his identity, he claimed that he was from the media, but was unable to mention the name of the media and refused to identify himself. He challenged us to be interviewed, and said: "I will record what you are going to say and broadcast it on the Internet half an hour later. You cannot do anything to me!" Chen Xin told him that he was welcomed to record our slogans and speeches and upload them online. Chen Xin also expressed the intention to record what he said and what he did, and let the public be the judge. When Goh Chee Horng came over, intending to do the recording, that man left in haste, and he seemed worried. One person (not in the picture) came forward to offer us assistance. He queried the man in black for swearing at us. Thereupon, the man in black left and never returned to harass us. Whenever we met him again, he would shy away from us. We did not stop displaying the two banners despite the drizzle and the hot sun. Obviously, the message conveyed by the banners aroused the sympathy of many participants of the rally. Many of them, one after another, gathered and took pictures in front of our banners to show their support. Picture above: A group of women carrying self-made handbags with handprinted slogan "fight for the establishment of the branches of Catholic High School and SJK(C) Yak Chee" gathered in front of our banner. (We got to know subsequently that they were residents from Puchong.) The lady (front row, 3rd from the right) wearing a black jacket and a pair of light green trousers, took out from her bag a card printed with the slogan: "Wee Ka Siong sells out Chinese education", and held it in her hand when her photo was taken. 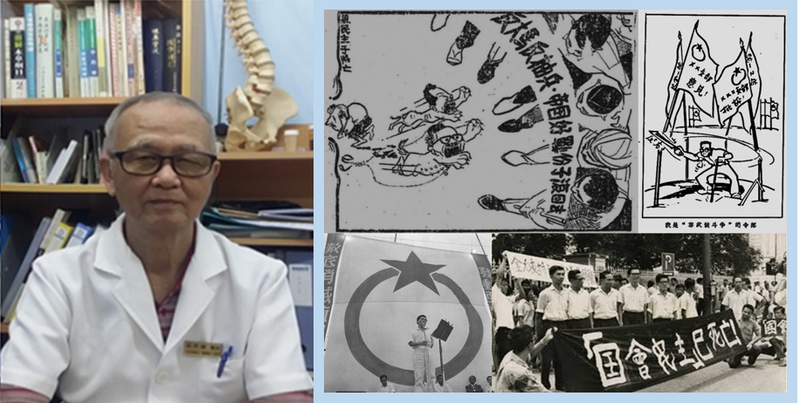 The banners were carried by Nasir (left) and Nyam Kee Han (right). The women were reluctant to leave after taking the picture in front of the banner that bore the message "MCA leadership sells out Chinese education! Wee Ka Siong should resign to make an apology!". They then moved on and took a photo in front of the other banner that read: "KA SIONG, MCA & BN BELONG TO DUSTBINS OF HISTORY". Picture above: See their happy faces. They appeared in a happy mood, while looking at Wee Ka Siong with disdain. They seemed to agree that the Chinese community should consign MCA and BN to the dustbin of history. The banner was carried by Nyam Kee Han (standing behind with his face being covered) and Lee Chen Feng (right). The one half squatting (right hand side), showing "thumbs down" gesture was Chen Xin. Our slogans had moved the hearts of more and more people. Some of them even showed their support via action. The organiser sent another personnel (the person in 325 campaign's T-shirt), trying to discourage us from displaying our banners. Picture above: Chen Xin (wearing leather hat) confronted the man who claimed to be the officer in charge of the assembly. But he was reluctant to identify himself. "We respect the organiser and assembly by distancing ourselves away from the platform. This is a public place. We have the right to express our opinion in this field. On what grounds are you preventing us from expressing our views? If Dong Zong's leadership thinks that they can do so, they are free to have a debate with us!" Not long after that, the organiser asked RELAs they hired temporarily to request us to remove our banners. Chen Xin, FOS Johor committee member, flatly refused, and told them that we were here today to express our views. We did not mean to disrupt the rally. Chen Xin told them very gently that we wished to know: who ordered them to request us to remove our banners; he belonged to which organisation; what position he was holding. On what grounds and pursuant to what regulations, he was making such request? One of the RELAs (wearing a brown cap) immediately made a phone call, and requested the person in charge to come over to negotiate. However, no one turned up till the end of the assembly. Since then, no one came to pester us about the banners. The middle-aged man in black (on the left in the picture above) by his gesture signified his agreement with our slogan: "MCA leadership sells out Chinese education! Wee Ka Siong should resign to make an apology!". Two young men were holding yellow placards (on the right). One of them had a headband "Step down, Wee Ka Siong!". The young man in black shirt and short jeans held a placard: "It has been 55 years. Man has even gone to the moon. Why do the Chinese education issues have yet to be resolved? MCA betrays Chinese community. They sell out all the interests of Chinese education and Chinese community!!!" Another young man standing behind our banner, held the front page of Oriental Daily dated 28 July. "Where is the Chinese secondary school that you had promised?" - a question was written on both sides of the newspaper cutting. It well reflects the thinking of the younger generations who are concerned about Chinese education. They realised that MCA has been deceiving the Chinese community all the while; and MCA is selling out Chinese education. About noon time, many participants displayed their banners containing such words as "Wee Ka Siong", "MCA", "Deputy Minister of MCA", "Ministry of Education", etc by the side of our banners, revealing their wishes and aspirations. They might have been embolden by our firm determination to display our banners despite unreasonable intimidation by the organisers. From the left: "MCA Betrays Chinese Education. Dong Zong Safeguards Chinese Education" (part of the contents are blocked by a participant in red shirt and black pants), "Deputy Minister of MCA, don't overburden the Chinese Community! ", "MCA leadership sells out Chinese education! Wee Ka Siong should resign to make an apology!" (our banner), "Wee Ka Siong is Incompetent. Step Down Now!" 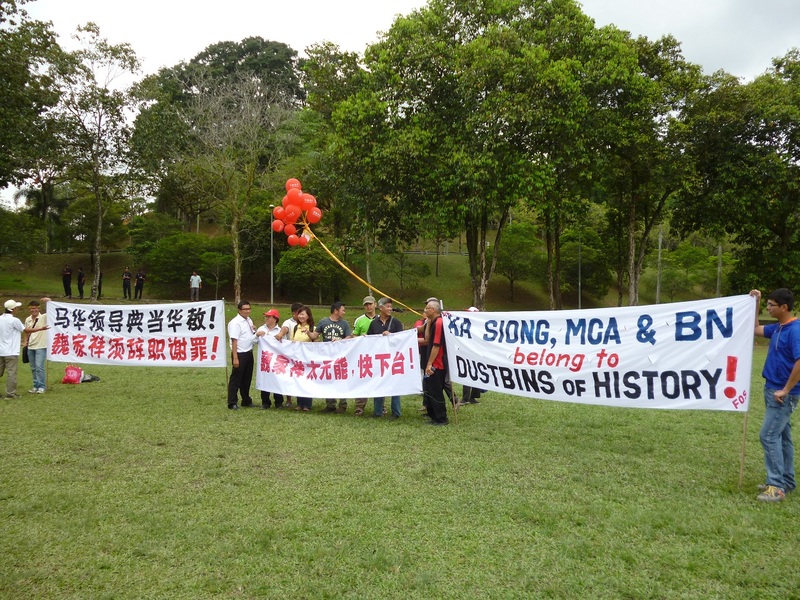 and "KA SIONG, MCA & BN BELONG TO DUSTBINS OF HISTORY" (our banner in English). The eye-catching banners lined up together conveyed a very clear message. Although repeated announcements had been made by the organiser that "We are above political parties, but not above politics! ", "Today is a gathering about Chinese education. It is a matter of education, not a matter of politics", Pictures above: Many participants still courageously displayed their placards and banners to express their thoughts and feelings towards Chinese education. This is so despite being repeatedly "reminded" by the organiser not to show or express their opposition to MCA and Wee Ka Siong. All this goes to show Dong Zong's fruitless efforts to prevent participants from expressing their resentment against Wee Ka Siong, MCA and BN. A lady in black (working in advertising industry) admired the calligraphy on the Chinese banner "MCA leadership sells out Chinese education! Wee Ka Siong should resign to make an apology!". She wanted to have a photo taken ­together with us. She took out a hand-made "Wee Ka Siong Betrays Chinese Education" placard and held it in one hand, while the other hand held a Friends of Suaram Johor Working Committee's 10th Anniversary Special Edition (souvenir issue). From the left: Nasir, Nyam Kee Han, the Lady and Chen Xin. 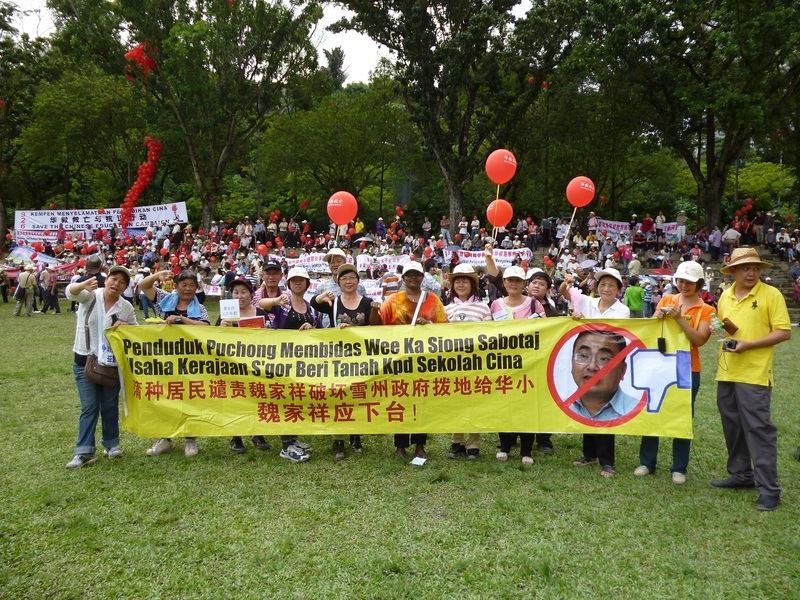 A group of participants brought their banner "Wee Ka Siong is Incompetent. Step Down Now!" and fastened it to the poles supporting our banners. They then took a photo in front of the banners. They were the very first group to link up their banner with ours. Perhaps they appreciated our determination to resist the absurd request made by the organiser. Meanwhile, their action had prompted many others to raise their banners again, and join forces with us without scruple. Participants equipped with cameras would not miss the chances of shooting a photo of our banners. Many of them opted to have photos taken of themselves in a standing or squatting position, in front of our banners, to show their support for our resolute stand. Some of them even showed gesture of "thumbs down" (meant to refer to "Wee Ka Siong"). Others through body language indicated that: "MCA leadership sells out Chinese education! Wee Ka Siong should resign to make an apology!" Although the organiser time and again reminded participants of the "taboo" imposed, that is, not to attack any individual or political party, someone went to the extent of singing a song entitled 'Give Me Back My Independent School' on stage. This song (adapted from a pop song) alleges that MCA leaders reneged on their promise to revive the Segamat Chinese Independent Secondary School within a time frame of 3 months. But the Chinese community has since waited in vain for as long as 26 years (equivalent to 9,490 days instead of 3 months). Not long after that scenario, another person appeared and sang another adapted song, expressing general dissatisfaction with Wee Ka Siong's inability to resolve problems faced by Chinese education. Wee even misled the Chinese community. This song severely critized MCA leaders represented by Wee Ka Siong in the Ministry of Education. These songs were greeted with great hilarity among the crowd. A group of residents from Puchong decided to leave early after their bilingual banner was forcibly removed from the stage. To them, it was meaningless to wait for Dong Zong representatives to return from Parliament after presenting a memorandum. The Puchong residents displayed their banner and took a photo before they left. 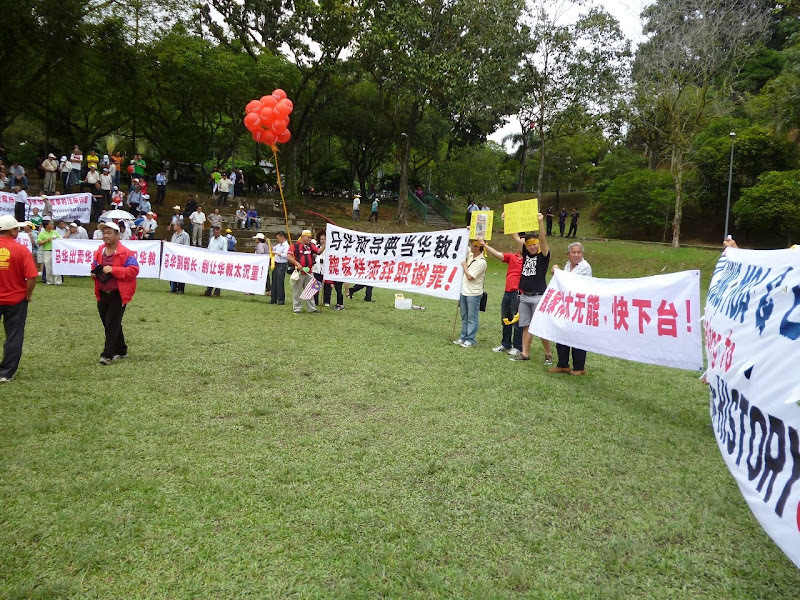 The banner read: "Penduduk Puchong Membidas Wee Ka Siong Sabotaj Usaha Kerajaan S'gor Beri Tanah Kpd Sekolah Cina" and "Puchong Residents Condemn Wee Ka Siong For Sabotaging Selangor State Government's Effort to Allocate Land For Chinese Primary Schools". "Wee Ka Siong Must Step Down!" (in Chinese). On the banner, there was a photo of Wee Ka Siong being given a "thumbs down". Isn't this clear enough that it is the people's aspirations and demand for Wee Ka Siong to step down? About 1 p.m. Dong Zong representatives led by Yap Sin Tian (wearing suit) returned to the venue of the gathering after they had submitted a memorandum to Nazri, Minister in the Prime Minister's Office. The crowd moved forward, and cheers were heard when the representatives walked towards the stage. Some people even shouted "Long Live Dong Zong! Long Live Dong Zong! ", showing their respect for Dong Zong in safeguarding the Chinese education. They happily believed that the representatives (led by Yap Sin Tian) were the champions of the cause of protecting Chinese education in the fight against MCA leadership. But little did they realise that the representatives (led by Yap Sin Tian and Chow Siew Hon) had already been interviewed shortly after submitting the memorandum. In the interview, they made it clear that the "926 gathering" had nothing to do with "Thumbs down Wee Ka Siong". They did not intend to demand for Wee Ka Siong's resignation. Yap Sin Tian (holding microphone) spoke to the crowd about the process of submitting the memorandum. No mention was made of the demand for Wee Ka Siong's resignation. After the short speech from Yap, the crowd started singing the song Together We Are Stronger, and began to disperse. Dong Zong (under the leadership of Yap Sin Tian and Chow Siew Hon) betrayed the aspirations of the Chinese community expressed at "325 gathering" and "926 gathering", that is, Wee Ka Siong should resign. Dong Zong leadership had duped the 40,000 supporters into signing the petition for the "926 Save Chinese Education Campaign". Dong Zong initiated the "926 Save Chinese Education Signature Campaign", and urged the people to attend the gathering on September 26. They accused Wee Ka Siong of breaking his promise to the people, selling out Chinese education and demanding Wee Ka Siong to step down! The masses signed the petition and attended the gathering simply because they were of the view that the MCA leadership represented by Wee Ka Siong (in the Ministry of Education) has betrayed the Chinese education. The stark reality is: Dong Zong leadership is faint-hearted, and 926 campaign has petered out. One wonders: how would the Chinese community react to such sad state of affairs?